Contemporary ‘gayness’ has been (arguably) constructed through the production of cultural goods that re-present ‘gay life’ and inform gay males’ self-understanding. ‘Authenticity’ modes of embodying gay identity, litmus tests that determine what represents legitimate ‘gayness’ are arguably filtered through media, artistic, intellectual, and other cultural goods that authenticate recognisable markers of gay maleness. The cultural construction of urban gay male identities in the North Atlantic world since the 1970s has been particularly marked by American experience, language, and symbols. This is perhaps most poignantly attested to by the ubiquity of annual gay pride marches that tend to coincide with commemorations of clashes between gay men and law enforcement agents in New York City of 1969. Berlin, along with other cities along the shores of the North Atlantic, offers a case in the significant influence of American experience, language and symbols in the construction of gay male urban cultures – not least because the ‘Christopher Street Day (CSD) Parade)’ is a key highlight in the annual gay cultural calendar. This is quite thought provoking when placed into the city’s historical context. Berlin has important pioneering local moments in the struggle for gay liberation and the construction of gay male identities that are widely known to precede Stonewall. ‘Christopher Street Day (CSD) Parade’, Berlin. The appropriation of the American experience raises questions about the place of local experience and memory in the construction of gay male culture and identity. It also (arguably) raises questions about authenticity, performance, and the commoditisation of gay male identity: How ‘authentic’ are cultural expressions of identity that are imitations and appropriations of foreign experience? Is authenticity necessary in what is clearly spectacle, staging, and performance of identity? Does the appropriation of American experience represent a mass-production and commoditisation of gay male identity? Altmann’s 1982 book spoke of the ‘Americanization of the homosexual’ – albeit in a different sense. Yet, his phrase may be an interesting term to think through American presence and influence in contexts such as Berlin. Transnational cultural influence has clearly played an important role in fostering global solidarity and in the expansion of LGBT rights. However, to what degree does re-appropriated culture actually serve to replace or subjugate local memory and experience? Berlin emerged at the end of the 19th Century as home to progressive academic and popular views on homosexuality. Locals ventured to explore homosexuality as a natural variation in human sexuality as opposed to it being a pathology or a moral failing. Spaces of acceptance and visibility for homosexual men emerged in the early twentieth century: During this period, the Schönenberg district became a key site of gay urban culture and socialisation. 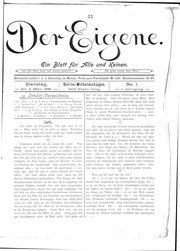 In 1896, ‘Der Eigene’ was launched as the city’s first ‘gay magazine’. Furthermore, in the early 20th Century, the work of Dr Magnus Hirschfeld validated Berliner progressive attitudes and urban cultural practice. As is widely known, Hirschfield sought to study human sexuality and discuss homosexuality as part of a spectrum of various expressions of human sexuality. The Second World War held particular significance for homosexual men who became targets of harsh Nazi anti-homosexual laws. In 1936, Himmler appointed a body that would seek to combat “homosexuality and abortion”. The infamous Paragraph 175 was strengthened to tighten punishments against homosexuality. Jail sentences against homosexual men became stricter and more frequent. and after the war erupted, several thousands of gay men were sent to concentration camps. Some were castrated. The marking of homosexual men with Pink Triangles during this period subsists as an enduring symbol of this episode in local LGBT history. The symbol is is integrated into present day Berlin LGBT semiotics and can be seen alongside the American-made – and now global – gay pride flag on shops and restaurants. While the pink triangle is a historical symbol that is locally significant and globally recognised, American memory of ‘gay liberation’ and the attendant cultural symbols arguably dominate the local. It may be interesting to reflect on whether this represents American cultural hegemony or whether these symbols are remnants of the late twentieth century when global solidarity was a pressing need in the North Atlantic World. As the twenty-first century brings about a revival and expansion of liberal attitudes to sexual and gender minorities, perhaps there is an opportunity to ‘de-Americanize’ the homosexual and explore and expand local symbols and memory tied to gay identity. The value in doing so may lie in the possibility of deepening our understanding of ‘authentic’ gay identity(ies), emphasising the importance of the everyday, and exploring linkages between authenticity and spectacle. Altmann, Dennis. “The homosexualization of America, the Americanization of the homosexual.” (1982).